Use select object (combobox) in the field. Data type - The data type Select is a drop-down object which allow the selection of information through a sliding window. 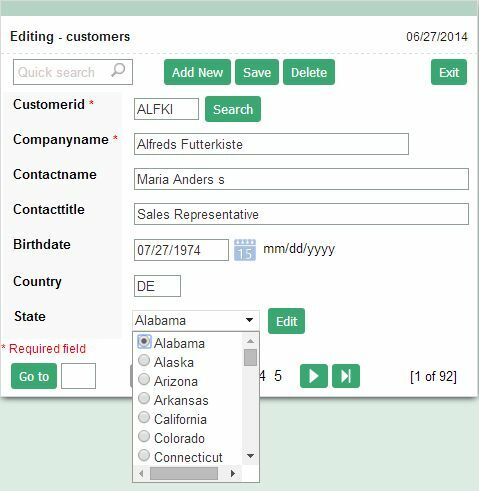 Edition lookup enables a a list of values display on forms fields. Note on the screen below the State field, before and after enabling the edition lookup to display a select object containing a custom list of KEYS / VALUES. These lists of KEYS / VALUES can be defined in two ways: based on a database table (Automatic lookup ) or from custom arrays (lookup manual). There are two options available: Automatic, based in a SQL statement to feed the list of values or Manual which is based on a custom entered list of values. 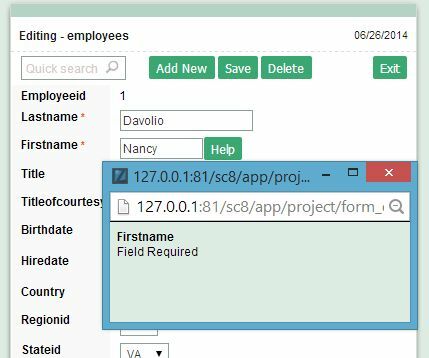 Populates the select object dynamically, based on a SQL statement, note the SQL statement on the picture bellow, it is required to retrieve a key (insert / update) and a value to display on the object field on the SQL command. SQL Select Statement - The query used to feed the select object on the form application, The developer shall use the pattern: "SELECT key_field , display_field FROM table ", retrieving always two fields. It is possible to use complexes SQL commands using many tables , views on it. Delimiter - The character used to separate the items on generated string, only applicable when using the multiple values option, the default delimiter is semicolon ( ; ). Height - Select object rows quantity. Use Title - Allows to display a title line on the select object. this option works combined with Title and Title internal value. Title - The object title or its default option displayed as the first line. Title internal value - The key used on insert or update events when the select object title is selected. 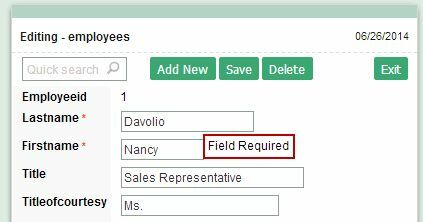 Reload form when value has changed - Forces a form reload when the OnChange event occurs on the select field, it is frequently used to re-load other lists which uses this field as parameter. Display original and lookup value- Displays the key field and the lookup field retrieved by the SQL statement. Separated by- Character used to separate KEY and LOOKUP values displayed on the list of values. Only applicable when using the option Display original and lookup value. Use specific connection- Allows to run the SQL statement in other connection available on current project. Create Link - Allows to create a link to a list update form. In the picture bellow, the select object is automatically reloaded after the popup form update. Checkbox Use the drop down - Display the field Select as a drop down list of checkboxes. Enables a select object based on a list of values filled manually as an array. See picture bellow. Lookup type- Selects the lookup type: Single Value , Multiple Values (delimiter), Multiple Values (position) and Multiple values (binary). Creates a simple select object, allows only one item selection. Image2: Single value lookup settings. Value- When an insert / update happens this value is saved on the table's field. Default - Selected value by default. Height- The quantity of rows displayed in this select object. Saves a single string on the table's field based on a list of values displayed. For example the selection: Sports, Movies and Traveling is saved on the table's field as a string like S;M;T. Note the default delimiter ( ; ) semicolon. Delimiter - The character used to separated the items on generated string, only applicable when using the multiple values option.The default delimiter is semicolon ( ; ). Height - Object number of lines. Saves on a string type field a list of values, for example it is possible to save answers to the topics: Gender , Civil Status and Hobby in only one table field. See in the table bellow the positions used by each answers on the saved string. Image4: Multiple Values lookup settings (position). Negative - Value saved on the string when no value is selected. Size- Bytes quantity into the saved string. Height- Object number of lines. See the examples bellow. On this lookup field interface the Value to each item is a integer number generated automatically. The selection is converted into a integer which is the sum of the items implicit values before saving. Example 1: By selecting Sports and Movies on the list of values, the saved value on table field is 3. Example 2: By selecting Sports, Traveling and Books on the list of values, the saved value on table field is 13. Label - Item displayed text . Update Button - Update all the item properties. Remove Button - Removes the item from the list. Clear Button - Clear the item edit form. Save Button - Saves the current list of values for re-usable purpose, the saved lists are displayed on the Load lookup definitions field. Load lookup definitions - Allows to use a saved list of values or a ScriptCase default list. 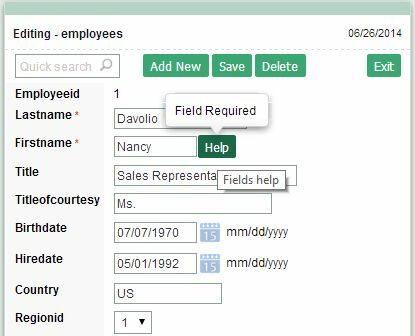 Checkbox using drop down - Display the field Select as a drop down list of checkboxes.